Mark first came to the Odyssey from the United Kingdom Sailing Academy (UKSA) were he was a skipper teaching practical sailing skills to students on the Professional Crew and Skipper Training program as well as a first mate on their flagship 67' Challenge Classic 'Albatross'. 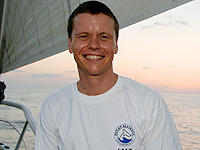 During the summer of 2003, Mark returned to the UKSA to further his teaching qualifications after which he accepted his new position as Captain of the Odyssey. With a degree in rural resources management, from the University of Wales, Aberystwyth, majoring in Ecological and Environmental Economics, he has a love for the ocean and a passion to contribute to the ongoing efforts of Ocean Alliance.